GPU miners of Equihash-based altcoins might want to check the latest lolMiner 0.5 – an OpenCL miner for both AMD and Nvidia GPUs that supports Equihash 144.5 (ANON, ASF, BTG, BTCZ, LitecoinZ, HeptaCoin, Safecoin, Snowgem, ZEL), Equihash 96.5 (Minexcoin), Equihash 192.7 (ZERO, Genesis, SafeCash) and the newly added Equihash 210_9 (Aion). The most interesting thing in the new version is the addition of Equihash 210_9 (Aion) support, though there are of course multiple fixes and improvements applied as well. The new version comes with complete rework of all GPU algorithms for both stability and speed and this also results in the memory footprint of the algorithms getting lower, so 144/5 is now fitting to 2.2 GB and thus works on 3 GB video cards and 192/7 is now close to 3GB and should work on any 4GB video card fine. The new 210/9 (AION)uses only about 800 MB of video memory. You can find the full changelog of the lolMiner 0.5 below. 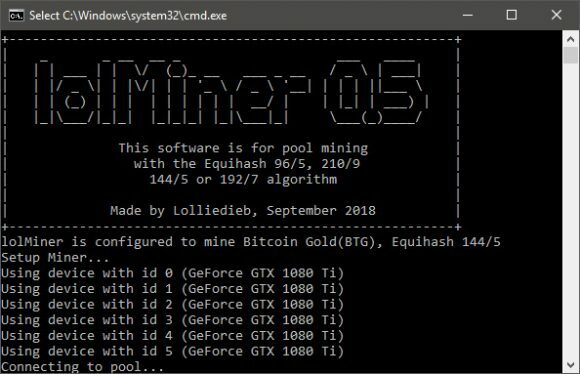 The lolMiner 0.5 is a closed source miner available with binary only releases for Windows and Linux. Do note that there is also a built-in developer fee, Equihash 144.5 and 192.7 should have 2% fee and Equihash 96.5 is with 1% fee. – Reduced the maximum work batch for 96/5 to 24 because higher values caused crashed some times. – Changed the standard short / long statistic intervals to 30 seconds and 5 minutes. – Changed the run_miner scripts not to loop any more (unless you use the _with_restart version), see known issues.